We have spiders in our home that look very much like this. Are there other spiders more common in Michigan that bear a resemblance? There are many spiders that are often misidentified as the Brown Recluse, so it is hard for me to answer that and tell you what you actually have there. It would help tremendously if you could get a clear picture of one or maybe even kill one with a spray and have the carcass identified. If you are not far from the Troy, Madison Heights, Royal Oak area, I would be glad to come look at one. If you can get a good pic to send me, or want me to look at the spiders, please only use my direct email and not leave any info in a post here. Keep an eye out for my next spider entry coming soon. I may have the spider you are talking about. We found it today in our living room and I had to save it from the cat, though it had already lost two of its legs. Very similar look to the Brown Recluse, but it did not have the violin and it did not have the same eye pattern. Body size, shape and legs as well as coloring was very close though. I want to check into it some more before I spout off what kind it is. I would hate to give misleading information, so I try to check into things before I post. are these spiders similar lookin to the daddy long leg? and do these liv in michigan? These are not very similar to the Daddy Long Leg in my opinion. DDL's have longer legs that are much thinner. Personally, I have never seen a DDL with a body large enough to be able to see a violin shape on it. Their bodies are thin and small in stature. Maybe only around 1/4 to 1/5 the length of the legs. As for the Brown recluse living in Michigan, to my knowledge they do not. I have yet to see any documentation showing they live in Michigan. The few and rare sitings in Michigan are believed to be cases where the recluse was brought here in luggage or a car on a trip from down south. The winters in Michigan are too cold for the recluse to live through. I just got out of a hospital and didn’t want to be back in one until I have my post-op appointment. looking like a Brown Recluse spider. Please don't take this wrong, but I would be surprised if you were bit by a Recluse here in Michigan, and I would be absolutely floored if three women were bit in Iron Mountain. Yes I believe you/they had the wounds to show for it. Yes I believe the doctors may have diagnosed them as Recluse bites. Even though I am no doctor, I would have to say those doctors are wrong. 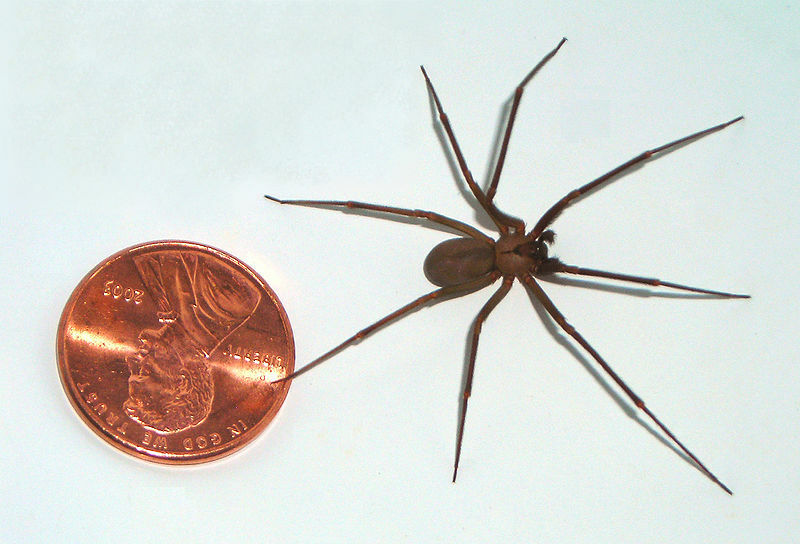 I have had two experts tell me that Michigan does not have the Brown Recluse. I have looked and looked, and I can find no documentation of any confirmed sightings of the spider except for one a long time ago. And that one was traced to the spider being brought to Michigan when someone returned from a trip. Many doctors go to school or do their clinicals down south where the Recluse is indigenous. When they come to practice here in Michigan, they are not aware that Michigan does not have the recluse. So when they see things like MRSA and other infections that are dangerous, or sometimes allergic reactions to spider bites, they remember their training down south and think it is a Recluse bite. It is due to these common misdiagnoses that there is such a great myth and fear of the Brown Recluse here in Michigan. This is a myth that I myself have fallen for until I started digging into it more. I have received many emails and comments from people saying they were bit, or they knew someone who was bit by a Brown Recluse here in Michigan. If so many people were being bit, why wouldn't we be finding the actual spiders here? Yet not one of these "bite victims" have said they actually killed or caught the spider and had it identified. Most of them say they never saw a spider at all and woke up with the bite. If you here a story that someone was bit by a recluse here in Michigan, please don't give it much credit. If you are diagnosed by a doctor that you were bit by a Recluse, try telling him that experts say there are NO Brown recluse spiders here in Michigan and to please check for infections and allergic reactions. If he will not, go to another doctor who will. Some of these terrible wounds people end up with in Michigan are due to a misdiagnosis and could possibly be stopped early if they are treated for the correct problem. Okay seriously.... So if it is "not" a Recluse doing all this flesh damaging effects on these so called 3 women of Irons then "what" the heck is the other spiders called doing the damage?? I guess I would like to know what is also doing the flesh eating damage a Recluse has the known damaging results of! Believe it or not, one of the most common spiders in Michigan (and one of the most common to be bit by), is the Yellow Sac Spider. The Yellow Sac Spider uses the same toxin as the Brown Recluse, but at a much lower potency. Most bites from these will have no to little effect, but on occasion they will cause a small blister that will break and leave a wound similar to the Recluse. The only difference is the Recluse wound can grow to around 10 inches across and the Yellow Sac wound will only grow to 2 or 3 inches across. Also the MRSA virus/infection (whatever it is) is nearly identical to the Recluse bite. 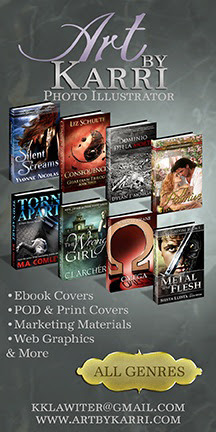 I have read there are other flesh infections that can do similar work, but I do not know the names of them. You need to stop downplaying the brown recluse in MI. Yes, it is not indigenous and could not survive outside in our winters. My daughter was bit and had a severe reaction several years ago. It arrived here from a Dell computer box shipped from Texas. We saw it and it might not have bitten her but she accidentally brushed against it on a wall after disturbing the box and some blankets that had been left undisturbed for a long time. Central lower MI not UP. If bitten, get medical attention and draw marker around perimeter of bite area. I down play it because it is the truth. It is more ridiculous to have people fearing a spider that 1) They will very likely never see in this state. 2) That actually is not near as dangerous as most people believe. 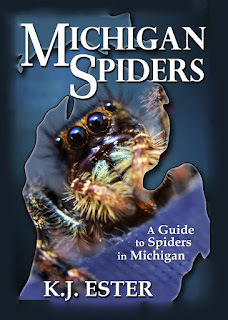 I have only uncovered about half a dozen cases now of the spider ever actually being found in Michigan. Every year I get plenty of stories of people being bit by one but nobody can ever show me proof. They either never see the spider, or didnt bother catching it to have it identified. You said your daughter was bit. You even admit it was a rogue that was brought into Michigan. The odds someone even will find a rogue is extremely low. The odds they will also be bitten is hard to imagine. Since only about half the bites from a recluse will cause a severe reaction, the odds of finding one in Michigan, getting bit by it, and it causing the bad bite? You have better odds of winning the megamillions. I would rather teach the truth than push fear of something they probably will never see in their life.